Supply your cafe, coffee shop, or breakfast bar with the farm fresh taste of this Farmer Rudolph's 32 oz. 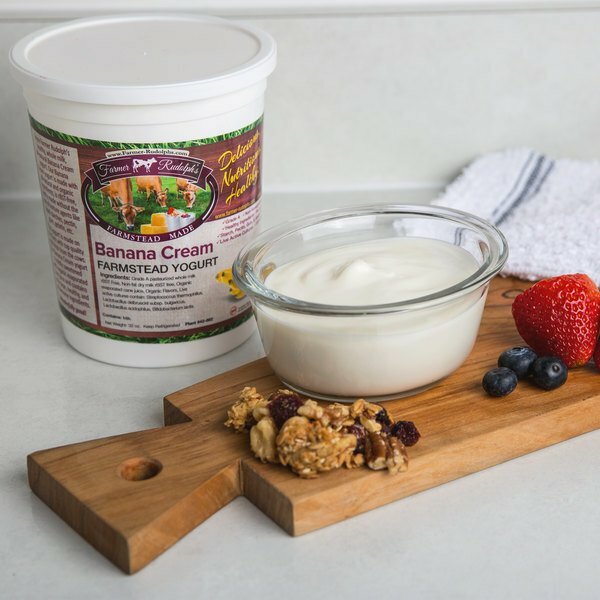 banana cream farmstead yogurt. 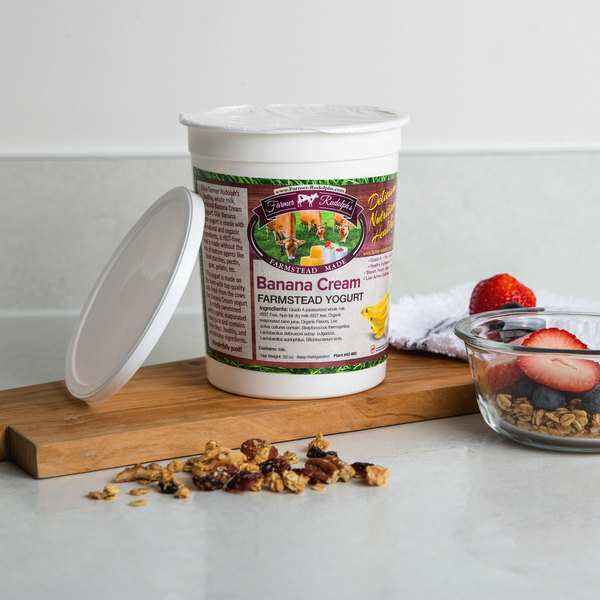 Featuring a smooth, full-bodied, banana cream flavor, this European-style Grade A yogurt is handcrafted and packed full of healthy, protective probiotics. Packaged in a 32 oz. 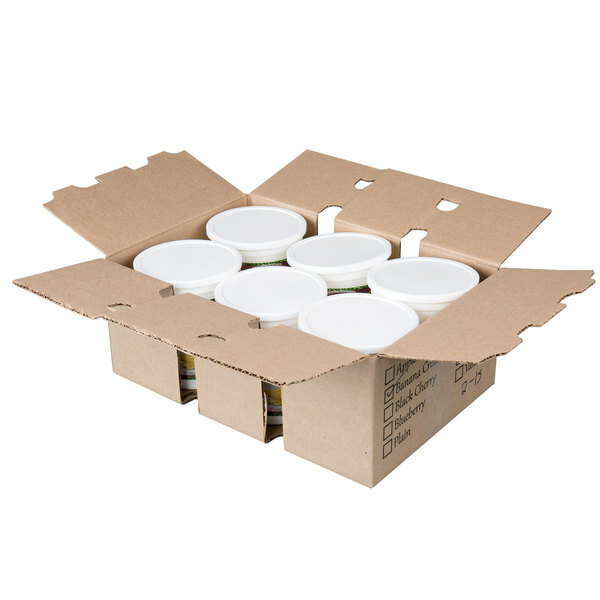 container, this yogurt is perfect for having on-hand to add to your signature smoothie drinks and bowls, breakfast parfaits, or as a healthy option at your breakfast bar. 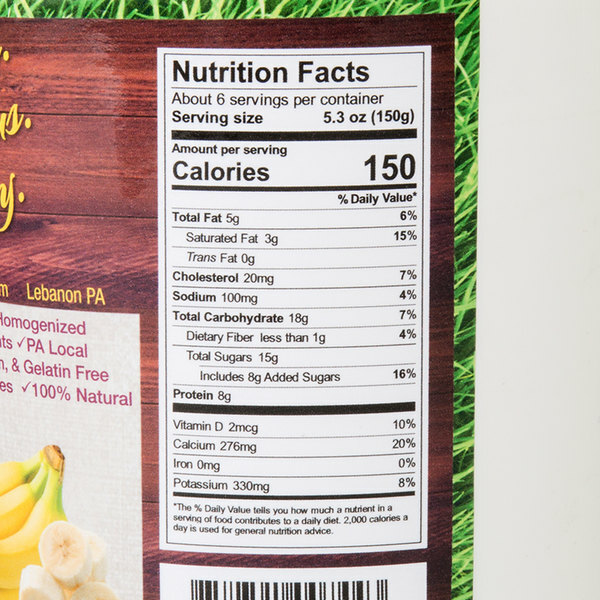 This yogurt is made with 100% natural ingredients, including rBST free milk and whole blended fruits. To ensure a high-quality taste, it is incubated in stainless steel vats, rather than incubating the yogurt in its containers. Plus, it features no stabilizers, such as starches, pectin, gum, or gelatins, resulting in more live active bacteria and a noticeably fresher taste. 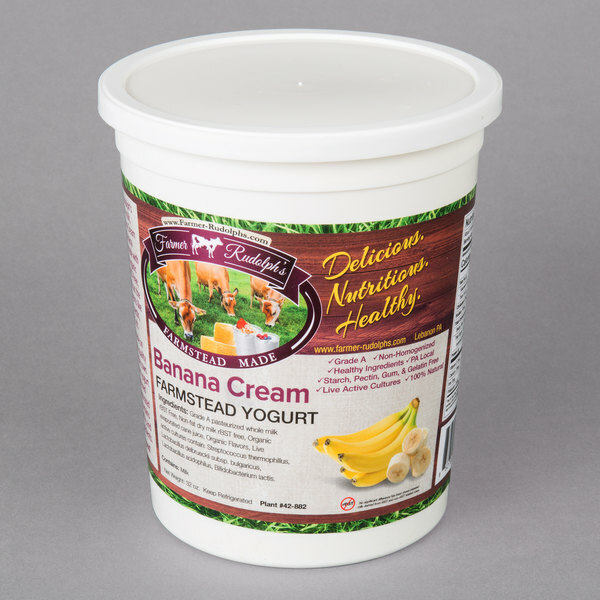 Provide your guests with high quality, fresh foods like this Farmer Rudolph's banana cream farmstead yogurt! Dedicated to handcrafting the finest quality artisan cheeses and yogurts, Farmer Rudolph's uses only 100% natural ingredients and no artificial ingredients, flavors, or colors to make their products. Based in southern Lebanon County in Pennsylvania, this small, family-based business grew from the ambition of making naturally nutritious and delicious cheeses and yogurts for their own family and community and remains a favorite among locals. Farmer Rudolph's is passionate about making their yogurts and cheeses the old fashioned way, using only the freshest milk and making all their products on the farm that they live on in their Grade A certified facility. With such attention to detail, you can be sure that Farmer Rudolph's farmstead cheeses and yogurts will deliver a high quality, farm fresh taste! we decided to try the farmer rudolphs banana flavored yogurt.it has a nice creamy texture and has a outstanding banana cream flavor.i would buy again.